· The "flu shot" — an inactivated vaccine (containing killed virus) that is given with a needle, usually in the arm. The flu shot is approved for use in people older than 6 months, including healthy people and people with chronic medical conditions. Available as monovalent, inactivated influenza A virus vaccine (H1N1) for IM injection. Indicated for active immunization against influenza caused by pandemic (H1N1) 2009 virus. Stimulates active immunity to influenza virus infection by inducing production of specific antibodies. · The nasal-spray flu vaccine —a vaccine made with live, weakened flu viruses that do not cause the flu (sometimes called LAIV for "live attenuated influenza vaccine" or FluMist®). LAIV (FluMist®) is approved for use in healthy* people 2-49 years of age who are not pregnant. Available as monovalent live virus vaccine for intranasal administration. Indicated for active immunization against influenza caused by pandemic (H1N1) 2009 virus. Stimulates active immunity to influenza virus infection by inducing production of specific antibodies. 2. People who have had a severe reaction to an influenza vaccination. 3. People who developed Guillain-Barré syndrome (GBS) within 6 weeks of getting an influenza vaccine. If these problems occur, they begin soon after the shot and usually last 1 to 2 days. Click here & here to read more on the flu vaccines. Disclaimer: The information provided are based on the guidelines from CDC and publications from other national health authorities. Please consult your physician and get professional advice before getting the vaccine shots. 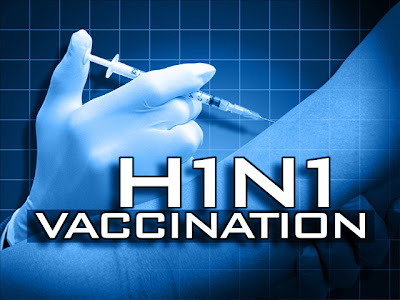 H1N1 Vaccination – Who should be vaccinated?